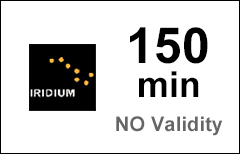 The Global 150-min airtime voucher refills your active Iridium Global prepaid account with 150 minutes of voice calls (NO validity time will be added). Maximum Age Limit. The Maximum Age Limit of the minutes in this Global 150-min voucher is 3 years.